Benzodiazepines enhance the effect of the neurotransmitter gamma-aminobutyric acid (GABA) at the GABAA receptor, resulting in sedative, hypnotic (sleep-inducing), anxiolytic (anti-anxiety), anticonvulsant, and muscle relaxant properties; also seen in the applied pharmacology of high doses of many shorter-acting benzodiazepines are amnesic-dissociative actions. These properties make benzodiazepines useful in treating anxiety, insomnia, agitation, seizures, muscle spasms, alcohol withdrawal and as a premedication for medical or dental procedures. 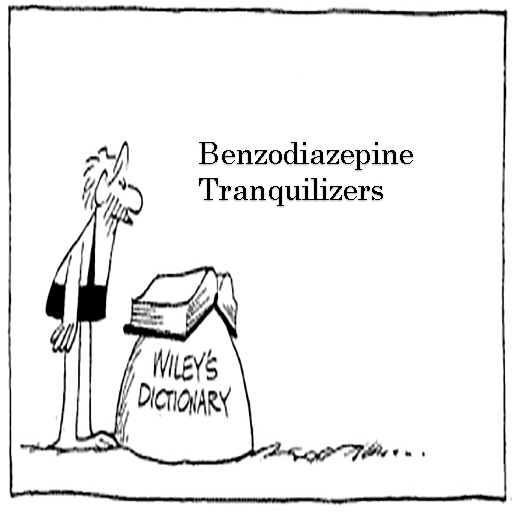 Benzodiazepines are categorized as either short-, intermediate- or long-acting. Short- and intermediate-acting benzodiazepines are preferred for the treatment of insomnia; longer-acting benzodiazepines are recommended for the treatment of anxiety. In general, benzodiazepines are safe and effective in the short term (less than four weeks), although cognitive impairments and paradoxical effects such as aggression or behavioral disinhibition occasionally occur. Long-term use is controversial due to concerns about adverse psychological and physical effects, increased questioning of effectiveness and because benzodiazepines are prone to cause, and upon cessation after long term use, a withdrawal syndrome. Due to adverse effects associated with the long-term use of benzodiazepines, withdrawal from benzodiazepines, in general, leads to improved physical and mental health. The elderly are at an increased risk of suffering from both short- and long-term adverse effects. Withdrawal from a long term may cause tinnitus as a side effect. There is controversy concerning the safety of benzodiazepines in pregnancy. While they are not major teratogens, uncertainty remains as to whether they cause cleft palate in a small number of babies and whether neurobehavioural effects occur as a result of prenatal exposure; they are known to cause withdrawal symptoms in the newborn. Benzodiazepines can be taken in overdoses and can cause dangerous deep unconsciousness. However, they are much less toxic than their predecessors, the barbiturates, and death rarely results when a benzodiazepine is the only drug taken; however, when combined with other central nervous system depressants such as alcohol and opiates, the potential for toxicity and fatal overdose increases. Benzodiazepines are commonly misused and taken in combination with other drugs of abuse. These medications are often used to help patients during a detoxification process, but these substances themselves can be abused and addictive. Patients who have taken a prescribed benzodiazepine for two weeks, even in a therapeutic dose, need to be safely detoxified with a slow taper. The amount of drug the person takes is dropped by 10-25% every week if the patient has minimal withdrawal symptoms. If the patient has taken very high doses for long periods of time, he or she is at increased risk for addiction. If a person has been taking a benzodiazepine medication for years, it can take months before he or she can get off the drug assumming a slow titration method is used. If one is weaned off benzodiazepines quickly (fast-track titration), or stopped cold-turkey, anticonvulsant medications like carbamazepine (Tegretol), divalproex sodium (Depakote) and gabapentin (Neurontin) can be used to make the detoxification process faster and more comfortable for the patient. Severe seizures can result from stopping “cold-turkey”, long term use of benzodiazepines. If a physician recommends one to quickly taper off benzodiazepines, careful attention and monitoring should be afforded patients typically including the use of anti-seizure medications. I should note from personal experience however that Depakote in particular can lead to an elevation in enzyme levels with the liver causing liver inflammation and in the worst case, liver failure. Careful monitoring of liver enzyme levels is critical if taking Depakote as an anti-seizure medication for benzodiazepine withdrawal.